All of our commercial products are released under our commercial license, and are available as NuGet packages so you can try them before purchasing a license activation. In trial mode our products usually show messages saying it is a trial version or has other product specific limitations that can be removed by purchasing a license for the host name where the product is being used. Once the license file is installed all trial messages or limitations will be removed. In order to purchase a license activation you first have to get our product nugets working in your application, then when your site is deployed to a hostname that you would like to purchase an activation for (i.e. deployed to your production environment), click the link in the alert, it will take you to our store and pass the correct product and host name information for you to complete your purchase. Product documentation is a work in progress, reference applications and video walk throughs are coming soon. Consider this a soft launch of a few products with a more official launch coming once all the documentation is in place. cloudscribe.Forms is a custom form and survey solution for ASP.NET Core. It integrates easily with and ASP.NET Core MVC website or applications. There are pre-built integration libraries for cloudscribe.Core and cloudscribe.SimpleContent. We have a sample solution on github that is pre-populated with data. 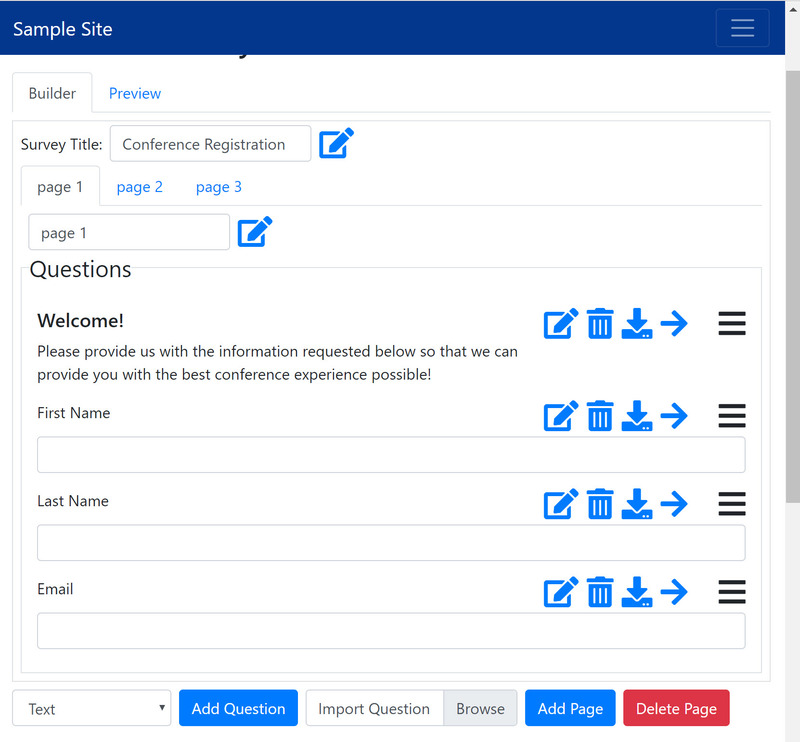 Whether you need an advanced contact form or complex surveys in your website, this solution has you covered. Available now at introductory pricing. cloudscribe Membership Paywall Solution builds on top of the open source cloudscribe.Core, and cloudscribe Stripe Integration to provide an easy to use solution for managing access permissions to your premium content, with ecommerce using Stripe.com to process payments. cloudscribe Core already provides you with management of users and roles and you can protect your premium content with roles and manage user role membership manually from the UI of cloudscribe Core. The Membership Paywall solution provides automation so users can purchase membership that automatically grants the needed role to view the premium content. It also automatically removes the user from the granted role if the membership subscription expires. By default memberships are automatically renewing using Stripe subscription payments, but users can opt out of automatic renewal at any time. It has support for alerts within the site to let the user know when the end of the subscription is getting near, and it supports email notifications to encourage users to renew membership when the expiration is near, and/or after it expires. You can also easily configure free trials that are only available to new users. cloudscribe Membership Paywall is shipped as NuGet packages on Nuget.org, so it is free to try, but will show a nag alert every few page requests indicating a free trial is in use. Purchase and install a license file per hostname to remove the nag alerts. We have a sample application that uses the NuGet packages, on Github, and will have a YouTube video walk through coming soon. The only way to purchase a license get it working in your application then click the link in the nag alert to purchase a license. cloudscribe Stripe Integration is a set of loosely coupled libraries for integrating Stripe payments in ASP.NET Core web applications. It does not depend on cloudscribe Core but has integration with cloudscribe Core. cloudscribe Membership Paywall Solution does depend on and require cloudscribe Stripe Integration. We also plan to use cloudscribe Stripe Integration in other ecommerce products and projects in the future. By default, ASP.NET Core Authorization Policies are defined in the Startup.cs file of the application. The policy requirements such as roles and/or claims defined there can be changed, but doing so requires re-compiling and deploying the application. In contrast, this solution stores the policy requirements in data storage so that role and claim requirements can be changed at any time from the provided management user interface which is implemented in ASP.NET Core MVC. This solution can be used with any ASP.NET MVC web application that uses Authorization Policies defined by roles and claims. There is also an integration library to use this solution with cloudscribe Core, allowing you to define different policy requirements per tenant for a given policy name. This solution is available as a set of NuGet packages so you can try the solution before purchasing a per host name license. In the absence of a valid license file you will see messages indicating the product is in trial mode. We have a couple of reference applications in GitHub that use the NuGet packages, one uses cloudscribe Core and the other is just a standard ASP.NET Core demo without any other cloudscribe libraries. The only way to purchase a license is to get the NuGet packages working in your application and then click the link in the nag alert to purchase a license for your hostname.